Join us at Mohegan Sun Pocono, which is located on 400 acres in the hillside of Plains, Pennsylvania, minutes from Wilkes-Barre. 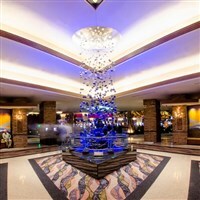 Mohegan Sun Pocono features a 238-room hotel with on-site spa and adjacent 20,000 square foot Convention Center. It is currently home to 82,000 square feet of gaming space including more than 90 table games, 2,300 slot machines and electronic table games, a variety of dining and shopping options, nightlife, entertainment and live harness racing. Spend the afteroon at the Mohegan Pocono Casino located on 400 acres in the hillside of Plains, PA. All passengers must be 21 or older and have valid identification. Good luck!